This was an unusual project. 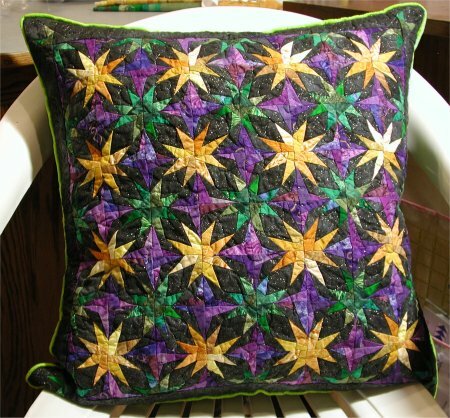 It began on September 25, 2002 with a 10" square fabric swap in Mardi Gras colors (gold, green, purple), hosted by Kristen on the About.com's Quilting Forum. Kristen added an additional part to the swap ... using all the fabric received in the swap, with optionally one extra color to provide for consistency, we were challenged to create at least a quilt top, send a picture to Kristen who would post all the entries (anonymously) on her webpage and invite the participants of the Quilting Forum to vote on which project they liked the best. Background story: I had resolved earlier in the year to not join any new swaps, either sewn blocks or simply fabric, or take any new quilt store classes because I really, *really*, REALLY needed to reduce my pile of UFOs (UnFinished Objects). My guilt level, as astounding as it may seem, was fairly high because I was accumulating a fairly substantial number of blocks to be asssembled into tops, tops in varying degrees of completion and completed tops waiting to be quilted. Man, I did NOT need to have more raw material for more tops! I was moderately successful in that resolve. But since there were other UFOs that had a higher finishing priority than the Mariner's Compass sampler, I bundled all the appropriate fabrics up (reserving them) and stored them safely. This project could wait, ageing properly, for a future completion date. Until, that is, Kristen announced her Mardi Gras swap. AAAAIIIEEEE! Here was a *perfect* opportunity to accumulate, quite painlessly, all sorts of different properly colored fabric for my abeyed Mariner's Compass quilt! But I did NOT WANT to join in a swap! I really needed to be working on finishing what I had, not adding to the pile! In short order, the swap was filled and the fabrics mailed out. Here are the swapped fabrics that I received and needed to work with. (There are only 11 golds because, as I was surprised to note, two swappers sent in the very same mottled gold fabric!). I was merrily anticipating using my Mariner's Compass sampler quilt with all the swapped 10" squares as the challenge piece when it was inadvertently brought to my attention that the swap challenge allowed for only ONE other fabric to be included in the challenge quilt top. Oh dear. Oh dear. My Mariner's Compass quilt was going to have LOTS of other fabrics; after all, it was a sampler of not only Mariner's Compass styles but of fabrics! I was doomed. Utterly doomed. My plan to kill two birds with one stone .. participating in the fabric swap to accumulate appropriately colored fabric for my Mariner's Compass quilt and then to USE that Mariner's Compass as the challenge quilt (which, by the way, would have blown EVERYONE else away!)... was promptly scuttled. [sigh] And it was such a wonderfully devious plan, too. Now, it was back to the drawing board, Thinking Cap on my head, to try and come up with a design that would allow the use of all the golds, purples & greens (along with that optional one other fabric) in a layout that not only would I like but stood a good chance of winning the challenge part of the swap. See, my parents have taught me that if something is worth doing, it's worth doing well and if I was going to enter something in the swap challenge, it needed to be something worthy of BEING entered. Now, it just so happened that serendipity was apparently favoring me. 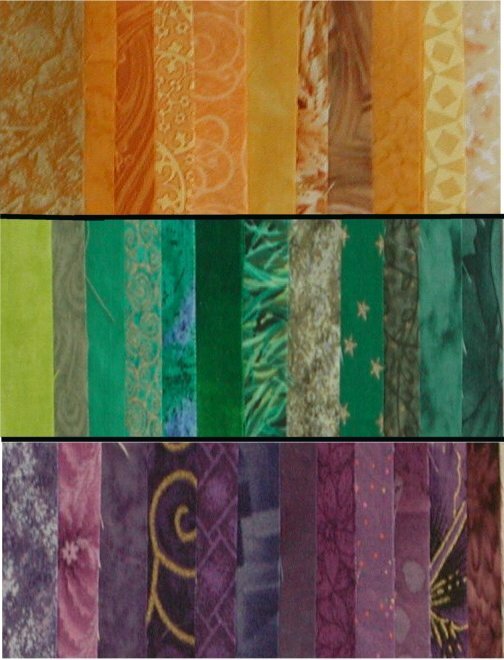 The January 2003 issue of "The Quilter Magazine" featured on its cover, a paper-pieced design by Carol Doak (the miniature paper-piecing diva), that was done in the Mardi Gras colors!! The accompanying article didn't say anything about the color choices of the cover model, nor was the cover quilt in a scrappy style .. BUT .. nevertheless, it WAS Mardi Gras colors! This was absolutely the answer to my predicament and I didn't even have to think of it! Although Carol had enlarged her design to be a full sized bed quilt for this issue, I used her pattern as a 3" square. I used all the swap fabrics plus a black w/ silver glitter as a background to create a 20" pillow cover. All of the swap fabrics coordinated beautifully with each other .. except one of the greens. The swap guidelines specified only gold, green and purple colors .. and said nothing regarding the different shades and hues. Well.... one fabric that I received was THE most challenging fabric: whereas 11 of the greens played nicely and coordinated with each other, that 12th green was most definitely different. It was an incredibly vibrant chartreuse green. It certainly fell within the swap guidelines, but it also stuck out like a sore thumb when put with the rest of the greens. How the HECK was I going to incorporate that chartreuse??? If I used it anywhere in the body of the design, those bright spots would look out of place. What to do??? What to do???? Knowing that I wasn't going to use it in the body allowed me to methodically work on the pillow top with all the other fabrics, while letting the Chartreuse Problem simmer away in the back of my brain. Eventually, I decided that I would make piping from the chartreuse and use it as an accent color in the perimeter seam of a knife edge pillow. My choice for the one other fabric was a soft black with silver glitter sprinkled all over; this was the background fabric. I added small paper-pieced corner blocks that were a portion of the block used in the main pillow at the end of the border strips. I did a rather large-scale meander in a silver/black metallic thread on the center square of the pillow and completed the block motif in outline stitching in the borders. Between the outline stitching in the borders and the edge of the pillow, I did more meandering stitching. As a result, I was pleased to note that the pillow top was remarkably *flat* .. obviously I had exactly the right amount of quilting in the right places so the distribution of quilting was sufficiently evenly placed. For the back of the pillow, I used black satin.